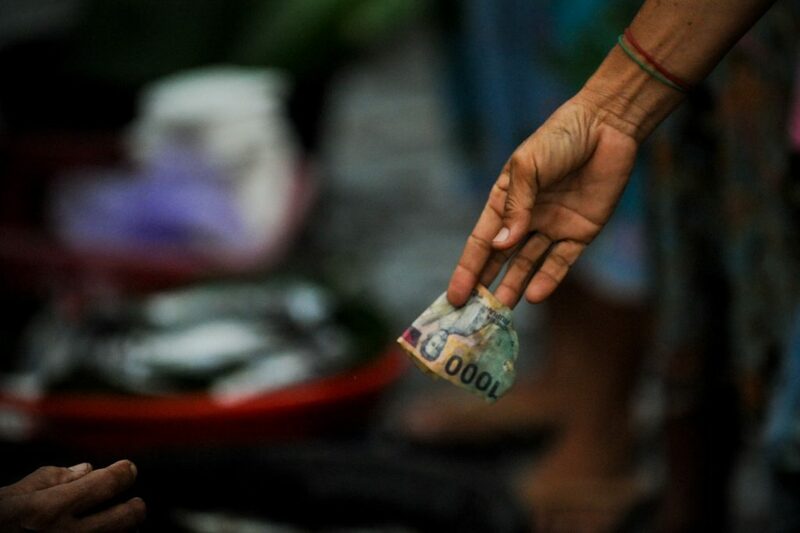 Cash Transfer Consumer pays for her purchase with 1000 rupiah at a market in Lenek Village, East Lombok District, Indonesia. Asian Development Bank. In the last few years there has been a proliferation of new “little development devices” and practices in places where we might least expect them: at the World Bank and in national development agencies usually associated with the kinds of large-scale infrastructure mega-projects that these institutions pioneered after World War II. Yet the current emphasis on “little” development devices cannot be understood as a straightforward reaction to earlier forms of development policy that used “big” development devices. Rather, if we want to understand the current fascination with little development devices, we need to look at a different moment in international development institutions’ history: the many prominent failures in development assistance that marked the 1990s, such as the AIDS epidemic, the Asian financial crisis, and the “lost decade” of development in sub-Saharan Africa. If we cannot understand the emergence of these new devices without paying attention to the recent failures of development policy, does that mean that they signal the failure of international development as we’ve known it? Yes and no: yes because many of them have been developed as innovative responses to the failures of development assistance, and no because they are nonetheless still very much development devices aimed at many of the same objectives that have held sway since the mid-twentieth century, including economic growth and poverty reduction. In fact, although policy failures are central to this story, the part they play is a surprisingly creative one. These failures were profound enough to provoke a crisis of development expertise, leading development practitioners to question their very metrics of success and failure. Over time, these practitioners sought to re-establish the grounds for their authority, reconceiving the object of development—poverty—by forging new metrics of aid success, by developing new techniques for its measurement, and by adopting new devices amenable to this kind of measurement. Rather than the failure of development, what precipitated the proliferation of these new micro-devices was thus the transformation of development governance through its engagement and problematization of failure, as well as its growing preoccupation with the ever-present possibility of future failures. Beginning in the 1990s, there was a lot of talk about the failure of development policies. Some external critics focused on the persistence of extreme poverty in sub-Saharan Africa, while others pointed to the AIDS crisis in Africa, or the sudden increase in poverty in Asia after the 1997–1998 financial crisis. All of these crises had occurred on the watch of the major development organizations in spite of (or, as many critics suggested, because of) their efforts. Inspired by these crises, both external critics and many of those working in the policy development and evaluation units at the World Bank and the International Monetary Fund (IMF) began to point to various policy failures (Collier 1997; Killick 1997). Staff in the Policy Development and Review department at the IMF, for example, noted that the ever-increasing number of conditions that aid packages imposed on poor countries had no positive effect on compliance, and were significantly reducing borrower governments’ “ownership” of the reforms (Boughton 2003). Meanwhile, the World Bank’s Operation Evaluation Department’s (OED) assessments were pointing to dramatically declining success rates—from 80% to 85% in the 1980s to less than 65% in the 1990s (OED 1994), figures that were of great concern to World Bank president James Wolfensohn. One of the underlying targets of these criticisms was the policy framework known as the “Washington Consensus,” a broadly neoliberal approach to development that put growth at its core and saw the market as the best way of achieving development goals (e.g., Stiglitz 1998:1). Yet, even as the World Bank dedicated its 1997 flagship World Development Report to the “rediscovery” of the state after two decades of denigrating or denying its role, the report was also very careful to distinguish the World Bank’s present strategy from earlier state-led approaches to development, arguing for the need to “take the burden off the state by involving citizens and communities in the delivery of core collective goods” (World Bank 1997:3). Treating both state- and market-dominated approaches as failures, the World Bank has pursued a middle way between the two, forging new and dynamic assemblages of public and private actors, claims, and practices to simultaneously pursue public goals and private interests (Best 2014a). Of course, policy failures occur all the time. Sometimes they are perceived as failures, and sometimes they are ignored. Yet occasionally they become what I call “contested failures”: failures important enough to produce widespread debates about the meaning of success and failure and the metrics through which we evaluate them (Best 2014b). The concept of contested failure is connected to what Andrew Barry calls “knowledge controversies,” in which the metrics that are usually taken for granted become, for a time, politicized (Barry 2012). These are interesting moments when we confront them in our everyday lives. Many of those of us who teach for a living, for example, have confronted a set of exams that fall so far below our expectations that they force us to re-evaluate our conceptions of success and failure (and, at least in my case, to change the assignment altogether). Such contested failures are fascinating moments in politics because the question of what counts as success is both highly technical—involving questions of evaluation and calculation—and normative—raising the question of what we value enough to define as success. The “aid effectiveness” debate that emerged in the 1990s and early 2000s was a classic example of this kind of contested failure, as its participants responded by problematizing and ultimately rethinking what makes aid succeed or fail. This widespread debate, which included practitioners, nongovernmental organizations (NGOs), academics, and politicians, raised important questions about why aid did not seem to be working, and ultimately produced some rather different definitions of what counts as successful development (World Bank 1998). The new definitions of success that began to take hold from the late 1990s onward were somewhat paradoxical. On the one hand, the conception of success that began to emerge was far bigger and messier than it had been in the past. In the place of narrowly economic definitions of effectiveness, agencies now sought to pursue a much broader and longer-term set of objectives, recognizing that economic development is inextricably linked to political, social, and cultural dynamics that are often particular to a given country or region. For example, development staff hoped to achieve a much greater level of “country ownership” over the policies that they believed needed to be pursued, seeking to encourage domestic engagement by various stakeholders. Their goal was to build political support for ambitious, longer-term institutional reforms, whether through (at least somewhat) participatory consultations or community-driven development. On the other hand, the metrics for measuring success became increasingly narrow, particularly as the enthusiasm for results and outcomes-based evaluation began to grow in the 2000s. These new metrics sought to respond to (and reduce) the ambiguities produced by the expanded conception of development objectives by making them more readily quantifiable. If development policymakers and aid ministers were no longer able to point to a school or dam to show where the dollars had gone, at least (the theory went) they could point to a measureable result that affirmed a direct line of causality between policy, output, and longer-term outcome. Not surprisingly, one of the effects of this drive to make aid outcomes measurable has been to create incentives for pursuing policies that are easier to measure. For example, the “cash on delivery” approach, developed in 2006 by the U.S.-based think tank Center for Global Development, promises to pay a set amount for each “unit” of an agreed result. One pilot project developed by the British Department for International Development (DFID) in Ethiopia pays the government £50 for each student who sits a particular exam, and £100 for each one who passes it. This kind of fixation on measurable results creates a proliferation of policies aimed at getting students in exam seats and bed-nets on beds while driving policymakers away from the kind of complex, messy conceptions of development success that the aid effectiveness debate had revealed to be so important. Many of the devices and practices that emerged in the years since the aid effectiveness debate reflect this hybrid character. Although the large-scale, macro-level ambitions of market-led development and poverty reduction remain at the heart of these policies, they are now increasingly pursued through more cautious, smaller-scale, micro-level techniques. This does not just mean that these interventions address the same targets at a smaller scale. Rather, the embrace of these new techniques of intervention corresponds to a new ontology of the object of development. One area in which we can clearly see this combination of macro-ambitions and micro-techniques is in efforts to reduce poverty. Part of what development researchers and practitioners found so unsettling about the Asian financial crisis and AIDS crisis was how these events pushed huge numbers of people back into poverty, undoing decades of progress. Led by the Social Protection Unit at the World Bank shortly after its creation in 1996, a number of aid agencies began to move away from static conceptions of poverty that generally assumed once an individual or family moved out of poverty they would stay that way (World Bank 2001a). These policy failures forced aid practitioners to rethink poverty on an ontological level, seeing it as a dynamic process rather than a static state (Best 2013). Staff working on social protection at the World Bank sought to redefine poverty as social risk and vulnerability, and to devise a range of more flexible devices in response. This approach to poverty reduction ultimately became a core part of the influential 2000–2001 World Development Report Attacking Poverty, and has been adopted by a number of other organizations, including the DFID and the Organisation for Economic Co-operation and Development (OECD; World Bank 2001b). The logic of the social risk approach is straightforward: in a volatile and unpredictable world where political, economic, climate, and health crises are always possible, poverty-reduction policy needs to help individuals and communities become better risk managers, capable of preparing for and responding to external shocks. Because some risks are covariant (affecting a large community or even the entire national population), traditional forms of insurance may not be effective because they were designed to respond to idiosyncratic risks (such as a single individual’s health difficulties, or a house fire). The state therefore becomes an important part of the solution, but only as one actor among many, resolving problems of market failure, supporting and combining with private sector initiatives, and enabling individuals to become more active in managing their own risks. Some of the most popular devices for managing poor people’s vulnerability to poverty, including conditional cash transfers (CCTs) and microcredit initiatives, clearly reflect this hybrid public-private, micro-level focus. CCTs are state-provided funds targeted toward very poor populations, particularly women, generally on the condition that they keep their children in school and bring them in for regular health check-ups. The funds are supposed to help poor people respond to immediate shocks, whereas the conditions are aimed at increasing the resilience of future generations and improving their chances of becoming better risk managers. Microcredit initiatives, which provide very small loans to people who would not qualify for conventional credit, started out as state and NGO-funded programs but have become increasingly market (and profit) driven in recent years. Their objective is to provide poor individuals with the kind of financial credit that they need to actively take “good” economic risks (such as investing in education or an entrepreneurial activity), in the belief that this will allow them to become more active and autonomous participants in the market economy. In a world filled with risk and potential, social protection systems help individuals and families especially the poor and vulnerable cope with crises and shocks, find jobs, improve productivity, invest in the health and education of their children, and protect the aging population (World Bank 2017). For the many experts and officials at international development agencies seeking to re-establish their authority in the wake of the failures of the 1990s, these new development devices are attractive in part because their promise of calculability. Many CCT programs have been explicitly designed to collect evidence about their effectiveness, and their growing popularity among development agencies is linked to the promise of demonstrating measurable results. After inconclusive evidence about whether it was the cash or the conditions in CCTs that had some positive effects on school enrollment, a growing number of CCT programs have been designed as randomized experiments that test the effectiveness of conditional and unconditional payments (Baird et al. 2010). In the case of microcredit, calculability plays a very different but nonetheless crucial role: the development of increasingly sophisticated techniques for evaluating and pricing credit risk among the very poor has made it possible for large financial firms to become involved, not only expanding microcredit but also building a new financial industry around the packaging and resale of these loans to foreign investors (Langevin 2017). These firms have managed in some cases to securitize large portfolios of microloans (rather like the subprime mortgages at the heart of the last global financial crisis), translating the often very high interest rates charged to poor borrowers into global flows of investor value (Aitken 2013). Although these various new development devices hold the promise of measurable results, we should not overestimate their technical proficiency; they continue to face the problem of failure even as they seek to respond to it. In fact, many of these new development initiatives have failed to meet at least some of their main objectives. The evidence on conditional cash transfers, though plentiful, is mixed: they do seem to have positive short-term effects on educational enrollment in particular, but their longer-term effects are difficult to demonstrate, and it is not clear yet whether the conditions themselves make any difference. There have also been some highly publicized failures in microcredit, including a rash of suicides by individuals crushed by microfinance debts in Andhra Pradesh, India, that have reinforced a broader questioning of its capacity to alleviate poverty. More fundamentally, the tension that I identify at the outset of this article—between a growing recognition of the messiness of development success and a persistent desire to tame and often deny that complexity by simplifying forms of measurement and evaluation—remains itself a nagging source of failure. Many of the development practitioners I have spoken to are well aware that it is nearly impossible to make tidy causal links between a given policy action and a complex series of longer-term outcomes, particularly where there are multiple other aid actors and external dynamics in play. Yet, because they are forced to play the game of measurable results, they have begun to design their policies so that they are as easy to measure as possible, distorting development objectives to make them appear calculable (Natsios 2010). This emergent micro approach to development assistance remains a paradoxical one: cultivating public goals by mobilizing private interests, pursuing more complex objectives while trying to translate them into simpler metrics, and ultimately courting repeated failure to give the veneer of success. Aitken, R. 2013. “The Financialization of Micro-Credit.” Development and Change 44(3):473–499. Baird, S., C. McIntosh, and B. Ösler. 2010. “Cash or Condition? Evidence from a Randomized Cash Transfer Program.” World Bank Policy Research Working Paper 5259. Barry, A. 2012. “Political Situations: Knowledge Controversies in Transnational Governance.” Critical Policy Studies 6(3):324–336. Best, J. 2013. “Redefining Poverty as Risk and Vulnerability: Shifting Strategies of Liberal Economic Governance.” Third World Quarterly 34(2):109–129. ———. 2014a. “The ‘Demand’ Side of Good Governance: The Return of the Public in World Bank Policy.” In The Return of the Public in Global Governance, edited by J. Best and A. Gheciu, pp. 97–119. Cambridge, UK: Cambridge University Press. ———. 2014b. Governing Failure: Provisional Expertise and the Transformation of Global Development Finance. Cambridge, UK: Cambridge University Press. Boughton, J. M. 2003. “Who’s in Charge? Ownership and Conditionality in IMF-Supported Programs.” IMF Working Paper WP/03/191. Collier, P. 1997. “The Failure of Conditionality.” Perspectives on Aid and Development, edited by C. Gwyn and J. Nelson, pp. 51–77. Washington, DC: Overseas Development Council. Killick, T. 1997. “Principals, Agents and the Failings of Conditionality.” Journal of International Development 9(4):483–494. Langevin, M. 2017. “L’agencement entre la haute finance et l’univers du développement: des conséquences multiples pour la formation des marchés (micro)financiers.” Canadian Journal of Development . Natsios, A. 2010. The Clash of the Counter-Bureaucracy and Development. Washington, DC: Center for Global Development. Operation Evaluation Department, World Bank (OED). 1994. Annual Review of Evaluation Results 1993. Washington, DC: Operation Evaluation Department, World Bank. Stiglitz, J. 1998. Towards a New Paradigm for Development: Strategies, Policies, and Processes. Prebisch Lecture. Geneva, Switzerland: United Nations Conference on Trade and Development. World Bank. 1997. World Development Report 1997: The State in a Changing World. Washington, DC,: World Bank. ———. 1998. Assessing Aid: What Works, What Doesn’t, and Why. New York: Oxford University Press. ———. 2001a. Social Protection Sector Strategy: From Safety Net to Springboard. Washington, DC: World Bank. ———. 2001b. World Development Report 2000/01: Attacking Poverty. Washington, DC: World Bank. ———. 2017. “Social Protection: Overview.” Available at link.